File photographs of Hima Das (L) and Rima Das. 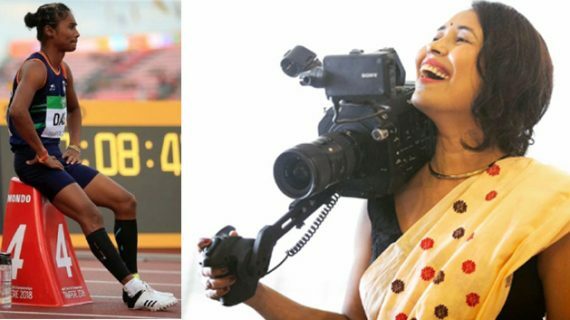 Filmmaker Rima Das, who brought laurels to Assam with her film ‘Village Rockstar’, on Thursday announced about her plan to make a film on sprinter Hima Das, who has recently created history and introduced Assam in world’s sports arena. While talking to media persons in Guwahati, award-winning filmmaker Rima Das also mentioned that she finds similarities with sprinter Hima Das, who hails from Dhing in Assam’s Nagaon district. Filmmaker Das also said in her movie, she wants to highlight the positive aspect how coming from an environment in village how she has been able to come into the limelight in the world arena. This positive side of Hima Das life attracts the filmmaker, said Rima Das. Rima Das added she also wants to make movies on sports and music. It may be mentioned that President Ram Nath Kovind presented director-producer Rima Das with Best Feature Film Award for her Assamese film ‘Village Rockstars’ during the National Awards ceremony this year. She received the award during the 65th National Film Awards ceremony held at the Vigyan Bhavan in New Delhi. Earlier, Bollywood star Akshay Kumar also expressed his willingness to make a biopic on golden girl Hima Das. Akshay Kumar in an interview to a national daily said that he would like to make a biopic on country’s latest sporting hero, athlete Hima Das, who won the country’s first gold medal in a track event at the World Junior Athletics Championships held at Tempere in Finland.